Heat oven to 325°F. Cut ribs into serving pieces; sprinkle with salt and pepper. Place ribs in 15x10x1-inch pan. Cover with foil; bake about 2 hours 30 minutes or until tender. Meanwhile, in 2-quart saucepan, mix sauce ingredients. Heat to boiling over medium heat, stirring frequently. Reduce heat to low; simmer uncovered 15 minutes, stirring occasionally. Place pork on unheated side of two-burner gas grill or over drip pan on charcoal grill. (If using one-burner gas grill, cook over low heat.) Cover grill; cook 15 to 20 minutes, brushing with sauce every 5 minutes, until pork is no longer pink and meat begins to pull away from bones. Discard any remaining sauce. 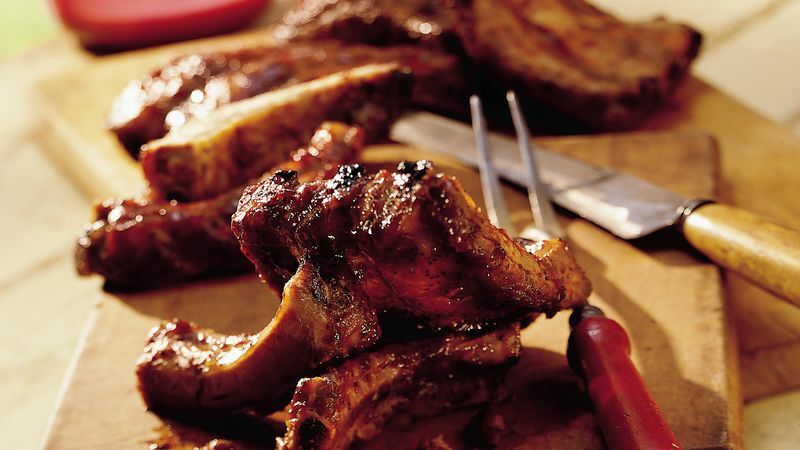 To finish the ribs in the oven instead of on the grill, after baking 2 1/2 hours, increase oven temperature to 450°F and bake uncovered 15 to 20 minutes longer, brushing with sauce every 5 minutes, until pork is no longer pink and meat begins to pull away from bones. At the supermarket, these ribs may be labeled as back ribs or pork ribs.